Video games can function as class texts in much the same way that books or movies do. Here are five recent games that are well worth your attention. Video games can engage players with more than just action. Impactful games are about serious topics and can create conditions for deeper learning. Like a good novel or cinematic experience, these types of games often have a strong narrative thread, appropriate for English Language Arts (ELA) classrooms. Consider having students play one of the games below, and then, to measure learning outcomes, use traditional assessment strategies like matching claims to evidence. Or have students create photo journals similar to the ones created by the protagonists in the games. Focus on the knowledge transferred from within the structure of the game to outside of it. One of the most moving recent games is That Dragon, Cancer. Based on a true story, it tells the story of Joel, a 4-year-old with terminal cancer. His parents, Ryan and Amy Green, designed it as a tribute to their son, who eventually lost his battle. That Dragon, Cancer is emotionally draining to play. You develop an attachment to the characters. The characters have blank polygon faces, which serves to invite players to empathetically project themselves into the story. Sounds of Joel laughing and playing are part of the experience. That Dragon, Cancer is available for computers and mobile devices. There is also a documentary, Thank You for Playing, which can be used along with the game in a classroom. 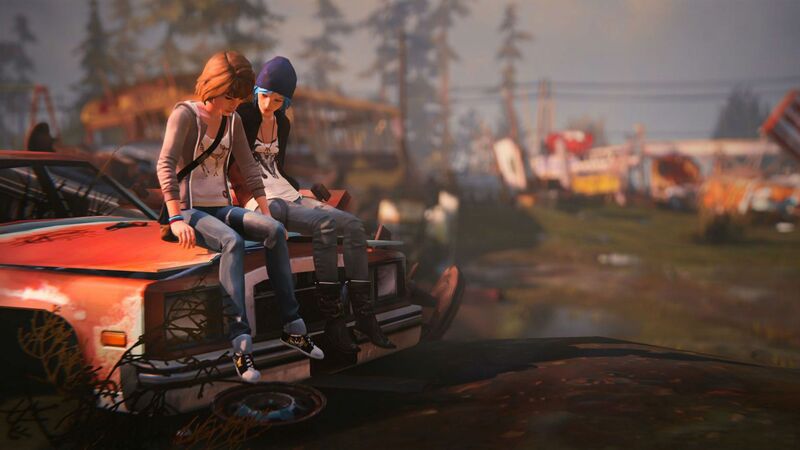 Life Is Strange is an emotional, narrative-driven game. Some players have professed to cry during the game’s final episode (there are five in all; the first is available as a free download). You play as Sam Caulfield, a girl who attends a competitive, private art school. She has the ability to rewind time. The result is a butterfly effect, a ripple in time, that affects subsequent events in the game. Much of the game involves viewing a narrative and then making decisions based on choices. One does not win a game like Life Is Strange; rather, it is an experience that has multiple endings. The game covers serious topics like bullying, teen suicide, drug use, and adolescent friendships. It is rated M for mature language and content. As with a serious film or a young adult novel with adult themes, secure permission slips from parents before you use it in class. Also of note is the Everyday Heroes anti-bullying scholarship fund that Square Enix, the publisher, created with the Parent Advocacy Coalition for Educational Rights (PACER). Set in Tehran, Iran, 1979 Revolution: Black Friday is a dystopian political thriller. It is story-driven and includes multiple-choice conversation trees. As in Life Is Strange, the protagonist is a photographer. When you take a photo in the game, it is compared with an actual image, a primary source from the Iranian Revolution. I recommend playing first before bringing it to students. It is available on mobile devices as well as computers. A strikingly beautiful game to play, Firewatch is set in a fictional national park in Wyoming in 1989. Players assume the role of Henry, whose tragic backstory has led him to work alone in the woods. His only contact with the outside world is Delilah, who communicates with him via walkie-talkie. As with Life Is Strange and 1979 Revolution, the voice acting is superb. More like a novel than a game, Firewatch features a mystery that slowly unfolds based on items the player finds and through Henry and Delilah’s conversations. Never Alone is a side-scrolling puzzle game presented as a hero’s journey tale. It brings to life oral legends of the Iñupiat people of Alaska. As levels are won, cultural insights—video interviews with modern Iñupiat—are unlocked. This adds to the authentic feel of the game as an experience. Similar to the Lego video games, there is a two-player, cooperative mode. Available for console, PC, tablet, and smartphone, the game introduces the audience to the mythos of the Cook Inlet peoples. Because video game licenses can be expensive, consider using learning centers. For example, 1979 Revolution could be situated in a station rotation covering political revolutions. It could be used as a text, alongside the graphic novel Persepolis, the film Argo, and BrainPOP videos about the French Revolution. You could include the other games in different units in a similar way. How do you envision using impactful games with your high school ELA students? Please share in the comments below.